Annual festival at the shrine Ootokonushi Jinja in Nanao Town. On an open stage on the float are decorations of popular traditional theater figures. They have large levers of 8 meters with flags, where a group of young man stand to try and lift the front wheels for a curve. The floats are decorated with green leaves of regional oak trees (kashiwa 柏), hence the name. These floats are made by three villages, Uo-Machi, Fuchuu-Machi and Kai-Machi. To pull these large floats through the small roads of the village is quite a job for the men in charge. 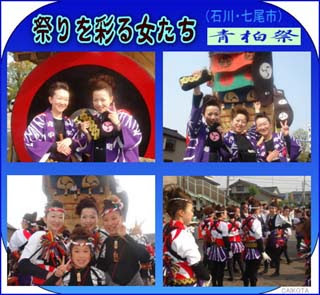 This festival is an important cultural property of Japan. 長まし Nagamashi sweets, eaten at the festival. They help to ward off bad fortune.
. WASHOKU : Mochi cakes .